This new VSK series of MAGN-A-PAK modules uses high voltage power thyristor/thyristor and thyristor/diode in seven basic configurations. The semiconductors are electrically isolated from the metal base, allowing common heatsinks and compact assemblies to be built. They can be interconnected to form single phase or three phase bridges or as AC-switches when modules are connected in anti-parallel mode. 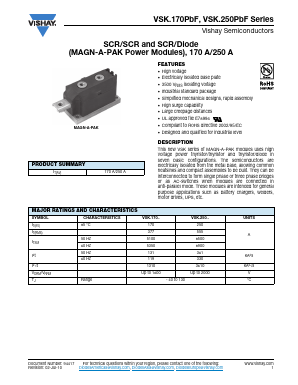 These modules are intended for general purpose applications such as battery chargers, welders, motor drives, UPS, etc.